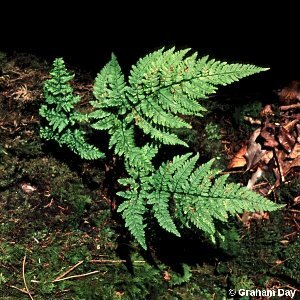 This is a fern of pronounced western distribution in Europe as a whole, with Ireland as one of its strongholds. 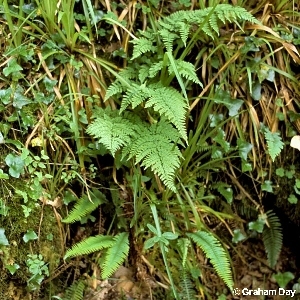 It is a plant of shaded places, woodlands and hedgerows, scattered across Northern Ireland. It gets its common name from the smell of hay which the leaves often give off when crushed. The stalk of the leaf is a dark purple in colour. All names: Dryopteris aemula (Aiton) Kuntze; Aspidium aemulum (Ait.) Sw.; Lastrea aemula (Ait.) Brackenr. ; Nephrodium aemulum (Ait.) Bak.